Members of the only Gaelic Choir in Perthshire have been hailed ambassadors for Scotland, the Gaelic language and culture, and their home town of Aberfeldy after a recent trip to Spain. The Aberfeldy and District Gaelic Choir visited the Costa Blanca town of Torrevieja, where it gave a concert in the newly opened Virgen del Carmen Cultural Centre, followed by another in a nearby town, Pilar de la Horadada, where it received a standing ovation from a mixed British and Spanish audience. Accompanying the Choir was professional singer-songwriter Alan Brown, who doubled as compere and singer, with his introductions in English being translated into Spanish. Piper Arthur Timperley stunned the audiences with a stirring medley of tunes, as well as piping the Choir on and off the stage. The Choir sang a mixture of Scottish, Gaelic and English songs, as well as a famous ‘habanera’ song from Torrevieja, “Barquito de Sal” which translates as “Little Salt Boat”. This proved particularly popular with the locals, as Torrevieja famously exports salt all over the world, including to Scotland for de-icing the wintry roads! 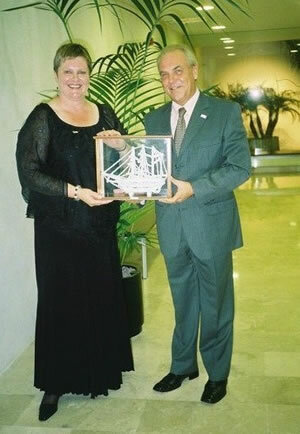 After the Torrevieja concert, choir conductor Frances McCallum was presented with a souvenir salt boat by one of the local tour organisers Graham Knight. Frances was also presented with a shield from Pilar de la Horadada. Reciprocating the gifts, Choir President May Brown presented both towns with shields from Perth and Kinross Provost Bob Scott, and Choir members distributed copious local Aberfeldy memorabilia, much of it provided by Aberfeldy Distillery and Dewar’s World of Whisky. The concerts were arranged after a former choir member, Liz Brodie, moved to Spain and met up with Alan Maggs, whose business “Summerhome” organises Choir trips to Spain, and other countries on request. Liz suggested to Frances that the Choir could combine a holiday break in Spain with the concerts to raise money for the Spanish Cancer Charity “Contra Cancer”. The suggestion proved worthwhile, as both concerts were a resounding success, raising nearly £1500 in total. “The Choir made it look easy” said Frances “ but a lot of organisation and rehearsing went into the trip. We had great fun – but we worked hard for it. The locals gave us a fantastic welcome and it was wonderful when Graham referred to us in his speech as ambassadors…..it made us all feel so proud, and it was a credit to our many supporters at home too”. Frances was referring to a pre-Spain concert held in Aberfeldy the weekend before the Choir’s departure, where voluntary audience donations raised £250. The money was donated to Aberfeldy’s Dalweem Comfort Fund, which provides items such as TVs and daytrips for elderly residents, and to the League of Friends of the Aberfeldy Cottage Hospital. 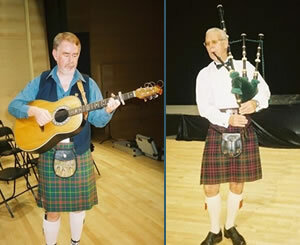 Alan Brown, compère and Arthur Timperley, piper. Frances McCallum, the choir's conductor, is presented with a souvenir salt boat by Graham Knight, one of the local tour organisers.